Do you think is the Mercedes-Benz C320 a good car? It is about 6 months ago when I got my current car which is a 2003 Mercedes-Benz C320, it was one of the happiest days in my life because who wouldn't like to have a luxury car such as BMW or Mercedes for example. But anyway, the point is this Mercedes C320 has made me spend too much money on repairs during the last 6 months. I did it a tune-up: +$600 , I change the rear tires: +$500, I have done 3 oil changes: +100 each one, the driver lock wasn't working well: $250, once the car stop working, it didn't start, I had to contract a towing service and taking it to the Mercedes dealership, cost: $650, for changing a wire which control the power in the engine, I didn't remember well its name. What else, I did a transmission maintain because it wasn't working very well: $550... ohh god, too much money, every time this car fails for something, the cost is like crazy, I also changed an injector which wasn't working well, the starting was failing when I bought the car, cost: $200, etc. 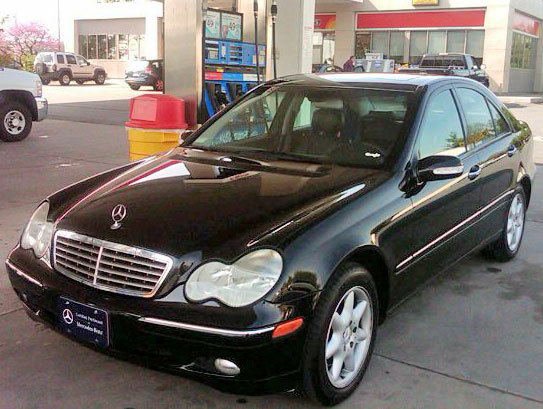 I know I have taken my Mercedes-Benz C320 many more times to the auto shop, but I don't remember exactly how many. I just wouldn't recommend this car to anybody, avoid it. If you like a Mercedes-Benz, you better wait until you have $20k or $30k in cash so that you can buy it with less than 50k miles or too much better, new one. I bought mine with 65k miles and some days after I got it, it started to fail. I just would like to think that I wasn't lucky, probably some other people have had a better experience with this Mercedes-Benz. If you have a C320 I'd love to hear what do you think about it. Thanks! By the way, I'm posting a picture in case you want to know wich car I'm talking about. Bad thing to hear that hot girl. Let me give you an advice. Don't trust in the dealership people. That's their job, create many problems for you car in order you take it back again and again. Try to get a local mechanic they are going to charge you cheaper and be honest with you. But anyway, it is weird you have had so many problems with you Mercedes-Benz C320, it seems to be a good car. I have drive it and it feel so good. A friend of mine also has a Mercedes-Benz C320, his only complaint about this car is he says the sides mirrors are too small and sometimes he can't see very well who's coming behind him. And also you are right, he says each time he has to take the car to the dealership is a lot of money spent. Hey Hot Girl, your Mercedes C320 looks really beautiful.... it seems to be a good car, I'm sorry to hear you have had many problem with that baby, have you check its CarFax, probably it was a salvage or flooded vehicle, you never know. I'd love to have a Mercedes-Benz, that C320 looks so good How much did you pay for it ?? Did you buy it in the Mercedes dealership ? that's an important point. If you get a luxury car, try to get it from the dealership, not from those small dealer lots at the streets, you can't trust in these people. Of course this a most Mercedes-Benz are good cars, the only problem with them is they are so expensive to maintain and probably that was the problem, its last owner never took the car the dealership.